Now if only every wait staff could feign rejection with an underhanded compliment like that – I do remember a half–smile cracking from the corner of her lips – then this world would be a much better place. One turned down customer at a time. A Roman invention tweaked so good, it has got to be the best I’ve ever had in the Lion City! 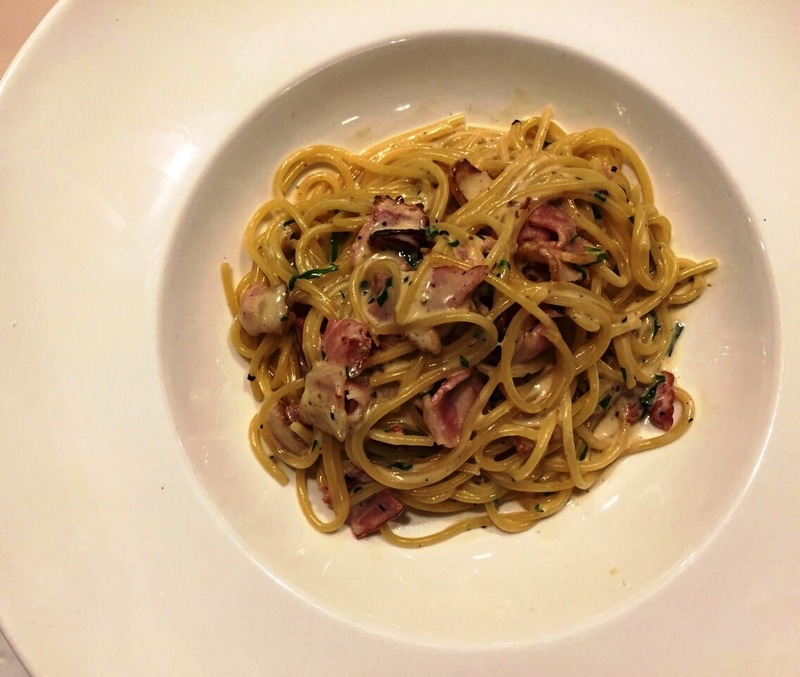 Having had a lid put on my brewing revulsion towards the addition of cream into their Pasta Carbonara – not to mention the decidedly deliberate omission of lots of freshly cracked black pepper – I allowed my slightly damaged ego to order the dish. It came right after I had devoured a couple of starters – the Foie Gras, a Chef’s Exclusive, and the Thai Beef Salad – and with the first forkful gave me a gastronomic euphoria that screamed in my head so loud, I had unknowingly let out not a few scrumptious “moans”. The decibel level seemed to have alienated – more like, embarrassed – all those at my table that they had considered moving away. This place gets mad props from me on presentation. 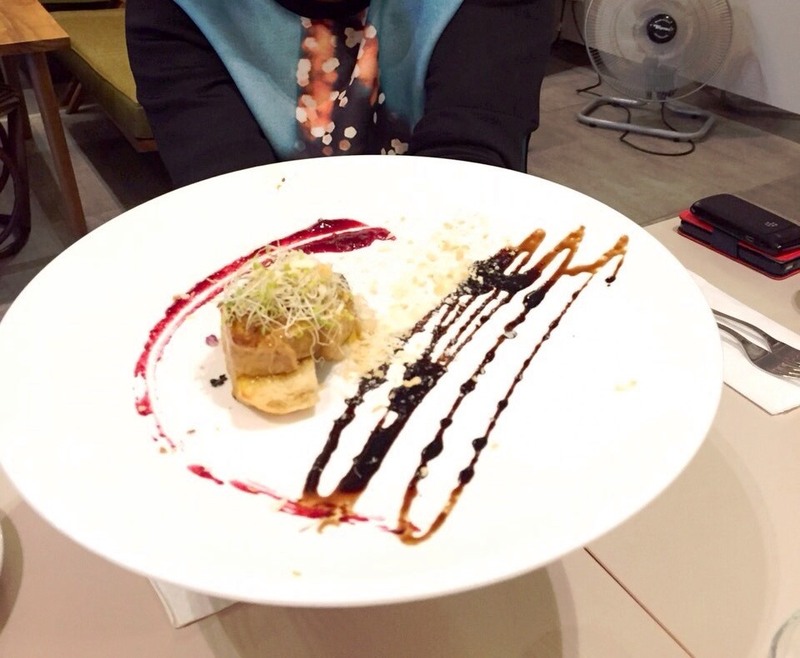 This humongous pristine white plate dwarfs the sliver of pan-fried foie gras nestled on a piece of garlic toast, meant to be stained with the dried fruit compote and dusted with a little bread crumbs. Asia is represented in sporadic scatterings on the menu. 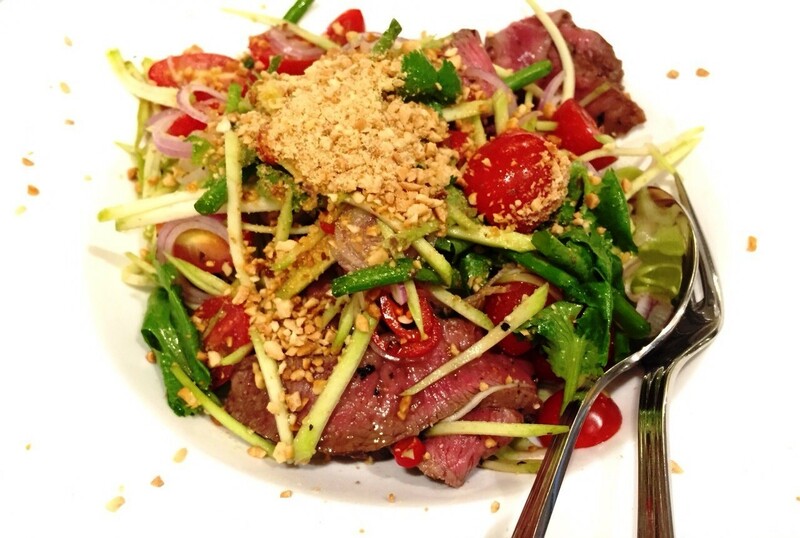 This Thai Beef Salad is redolent with the whiff of lemongrass and sweet basil, perfectly perfuming perfectly medium rare meat. The screams would come with every bite so I knew that it could only be quieted down with succumbing to its whim – asking for a second portion. Usually I would save any repeats to a subsequent visit. But the craving was unrelenting, demanded by my synapses right there and then. An attempt at flat lay on my Pasta Carbonara, which at first bite I knew would be the first of at least two. Right there and right then! Plate number two. Flat lay number two. This also came to be known as “Gone in 60 Seconds”! Hahaha! So I did, notwithstanding the wait staff’s eyeballs bulging out of their sockets. Not that I needed those to remind me that I was probably having more than enough. My S$ 80++ tab at the end of the meal told me that. For the first time ever here in Singapore, I insisted on leaving a generous tip for the servers and pulled them aside to convey a very personal message: “Please tell the Chef that this has got to be the best Pasta Carbonara I have ever had islandwide.” I have a very exacting recipe and expectation, so I felt pleasantly surprised to be so welcoming of change – to not be in control of what goes to my plate. I didn’t mind the addition of the cream. I loved having my palate wrapped in the comforting nuttiness of parmesan cheese redolent in the sauce. I didn’t miss the black pepper. I didn’t notice the parsley. And most of all, I didn’t mind the bill. 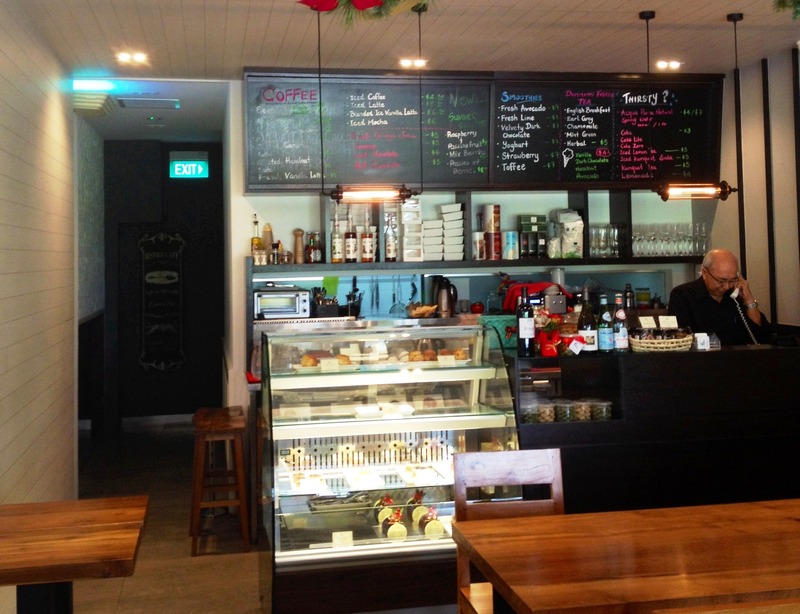 P. Bistro Café (http://www.p-bistro.com/) is at 142 Owen Road Singapore 218941. Contact them at +65 6392 2333, or through info@p-bistro.com. 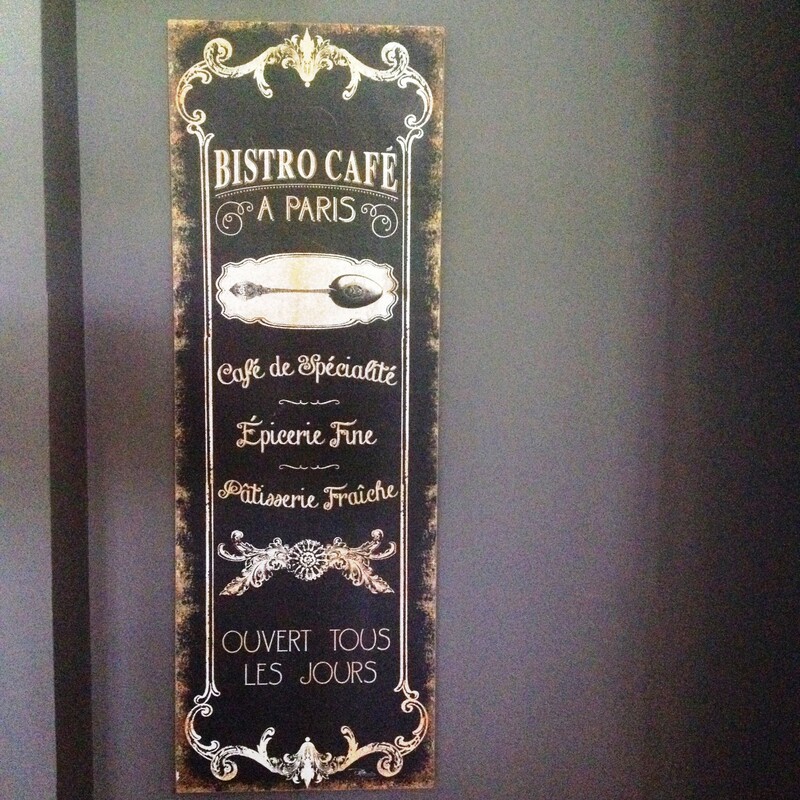 The very inviting, cozy bistro interiors greet you from the very moment you fling open the front door. “Damn, girl, excuse my French.” The signage on the way to the upstairs sitting area. 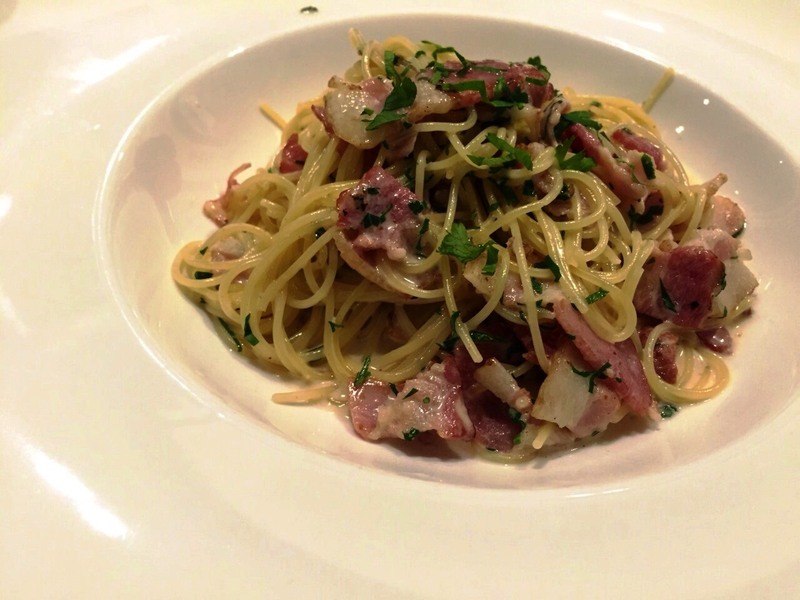 Everything on the Carbonara description on the menu earned a check from me – except the cream. And yes, the omission of lots of freshly cracked black pepper. Copyright © 2015 by eNTeNG c”,)™©’s MunchTime™©. All rights reserved. THE WONDER of home cooking lies in its simplicity. You fling open the refrigerator or cupboard door and just take it from there. My spaghetti alla carbonara! Rich and creamy and yet, no heavy cream! 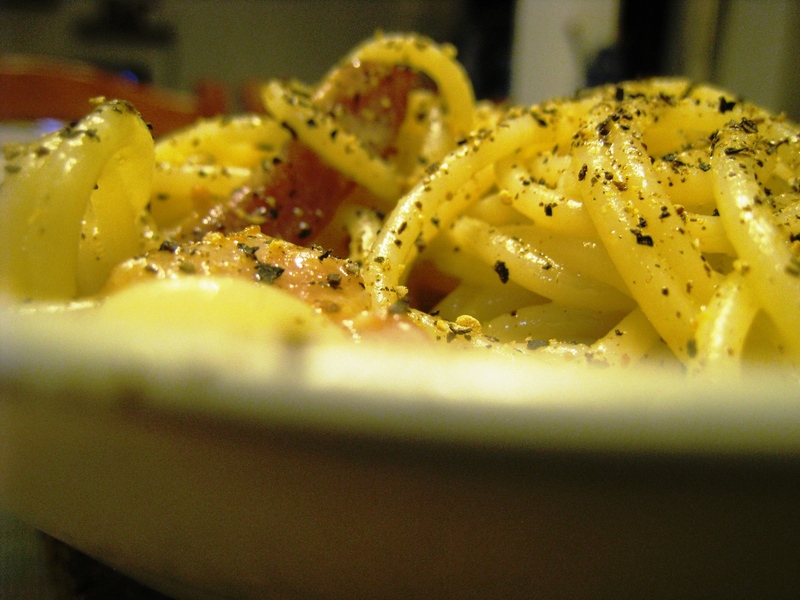 I feel that the cuisine that renders itself best interpreted at home is Italian. 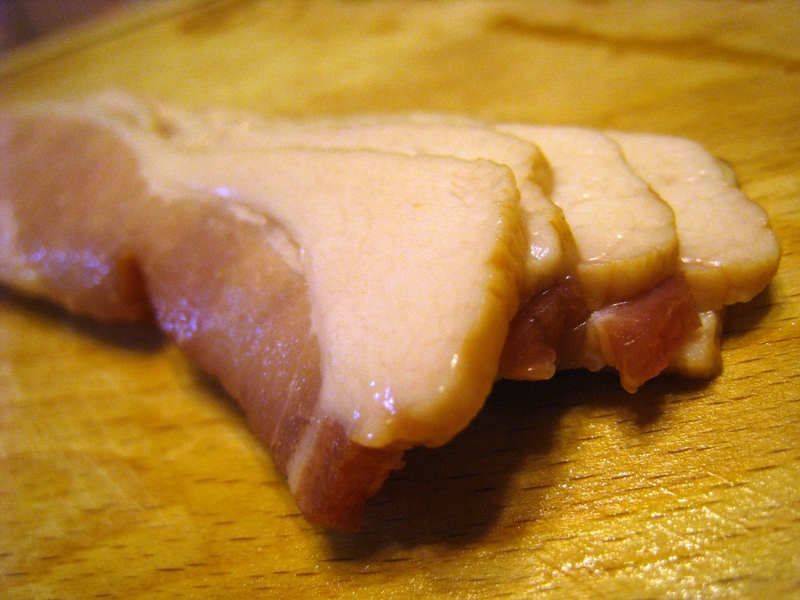 Their food focuses on the simplest of ingredients, the easiest of preparation, but all leading to maximum effect. A plate of pasta always seems so special. And perfect for quieting down after–midnight hunger pangs. Which is exactly what I’m doing right now as I write this. I’ve just arrived from another long day at work. And however tired I may be, I reckon that the 10 minutes total time I need to make my pasta–fixation–of–the-moment will be time well spent. Having been cooking for close to three decades now, I know that by the time the pasta is al dente, I shall be reaping the rewards of my solitary dinner awash with the feeling of an incredibly indulgent spoiled child. As they say, when in Rome, do as the Romans do. 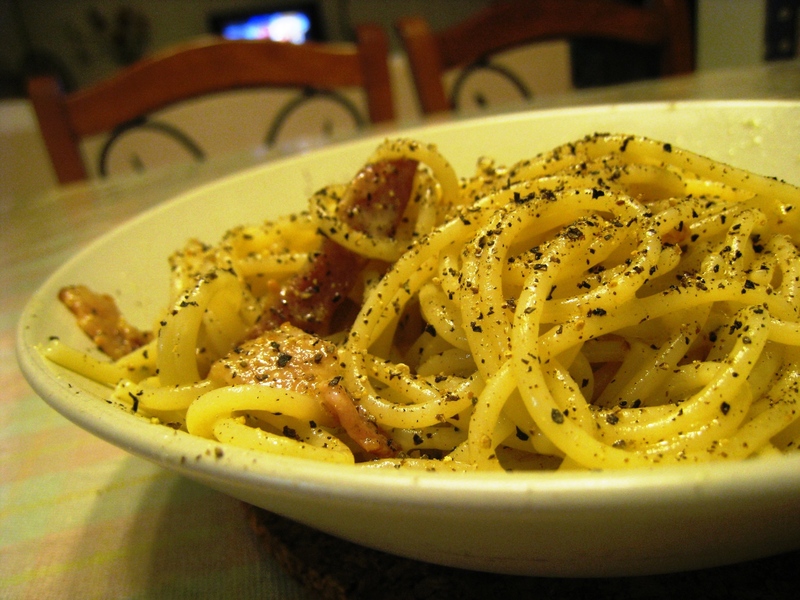 Spaghetti alla carbonara is a Roman invention. So I find it quite respectful to cook it as the Romans do – which means totally devoid of the heavy cream that the Filipino version swims in. 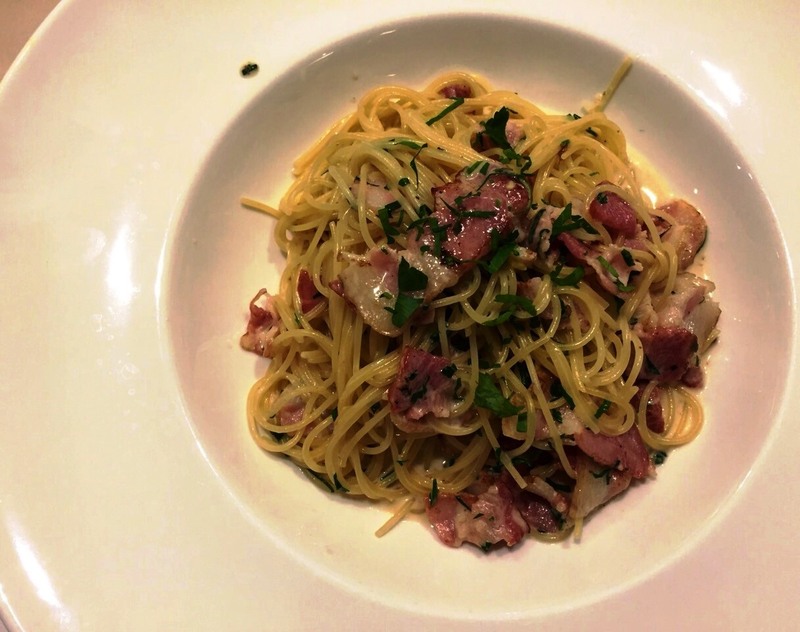 Traditionally, spaghetti alla carbonara is made with olive oil, guanciale or pancetta, fresh whole eggs, equal parts of Pecorino Romano and Parmigiano–Reggiano cheeses, and lots of freshly cracked black pepper. 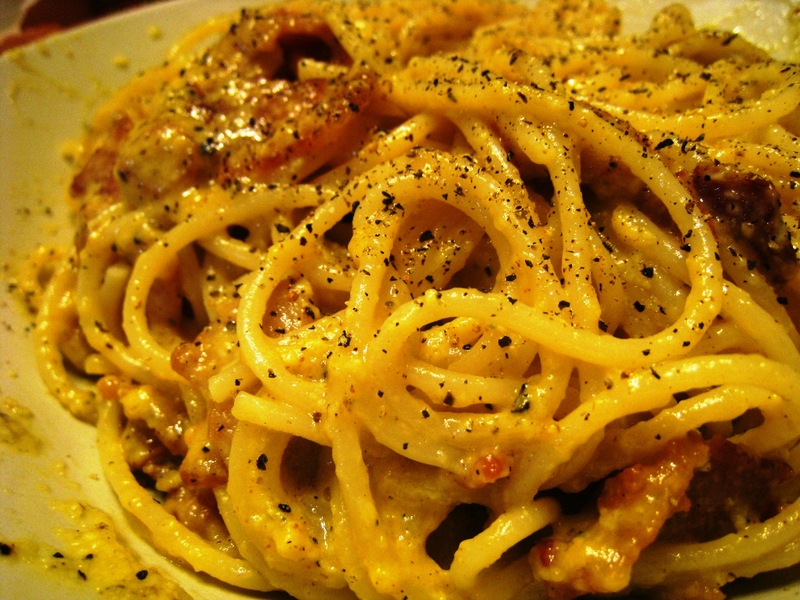 Dried spaghetti usually takes 12 minutes to cook. Since I always cook my pasta one to two minutes less than what the package tells me, I decide on 10 minutes. This is how I make one portion. As applicable, I indicate the brands I actually use or prefer. Feel free to use yours. Some are clearly substitutions (I don’t have guanciale or pancetta right now!). 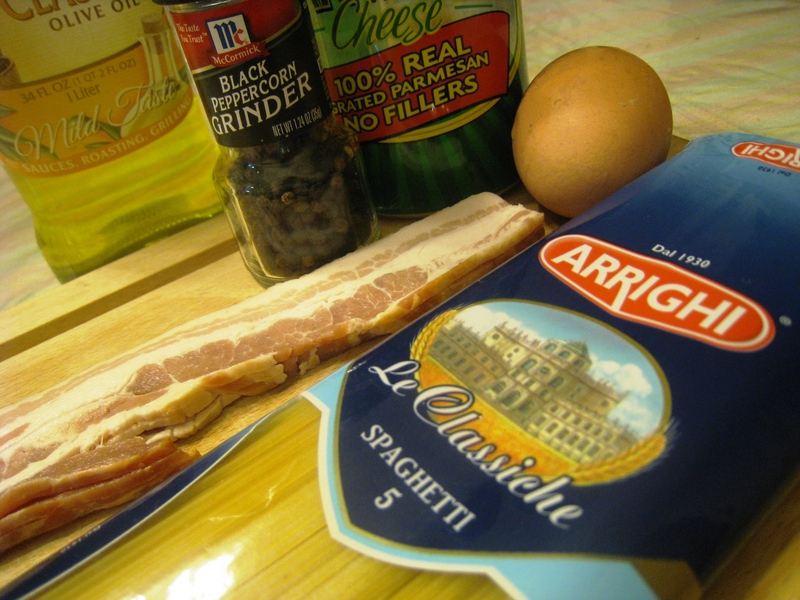 Refrigerator and store cupboard essentials to a most satisfying spaghetti carbonara! One whole egg when I’m less hungry. Two when I really am. Of course, two means I’m making enough for two portions, but to be consumed by only me. Haha! It is important to use UV-sterilized eggs. And oh yes, bring it to room temperature first. 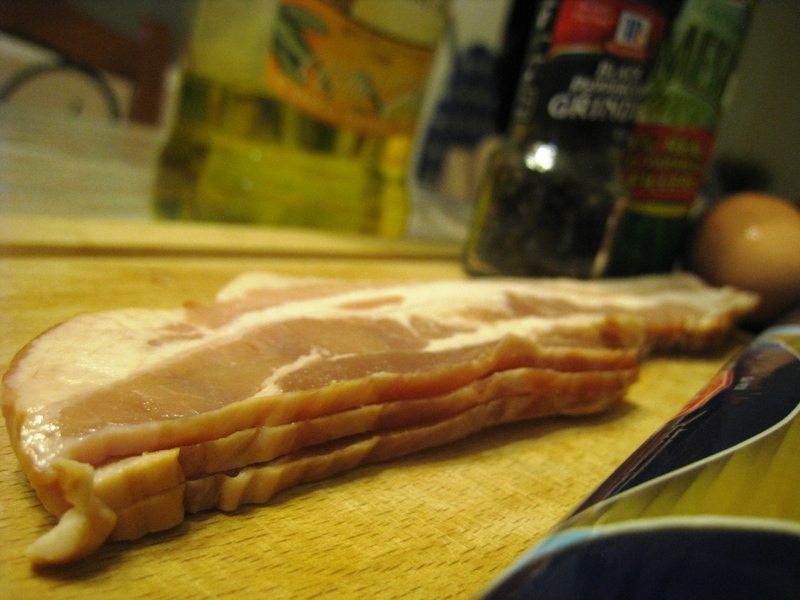 Regardless of whether I’m doing one or two portions, I use three to five rashers of Danish streaky bacon every single time. On this one time, I used exactly only three rashers. I’ve always loved De Cecco dried pasta which I believe is simply the best. But I’m pleasantly surprised to be enjoying Arrighi lately! I know that salt is salt is salt. But there’s something about MORTON® coarse Kosher salt that just makes any dish more delicious. MILLEL® remains to be my favorite parmesan cheese. I’d buy it in wedges which I’d snack on without ceasing. 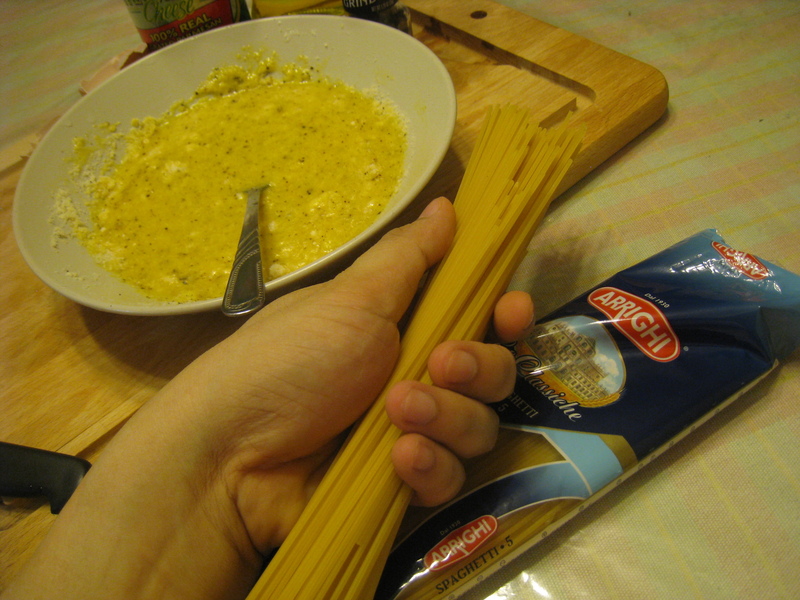 But whenever there’s no MILLEL®, there’s always Kraft® or Perfect Italiano™. Its flavor is bold but not quite strong. 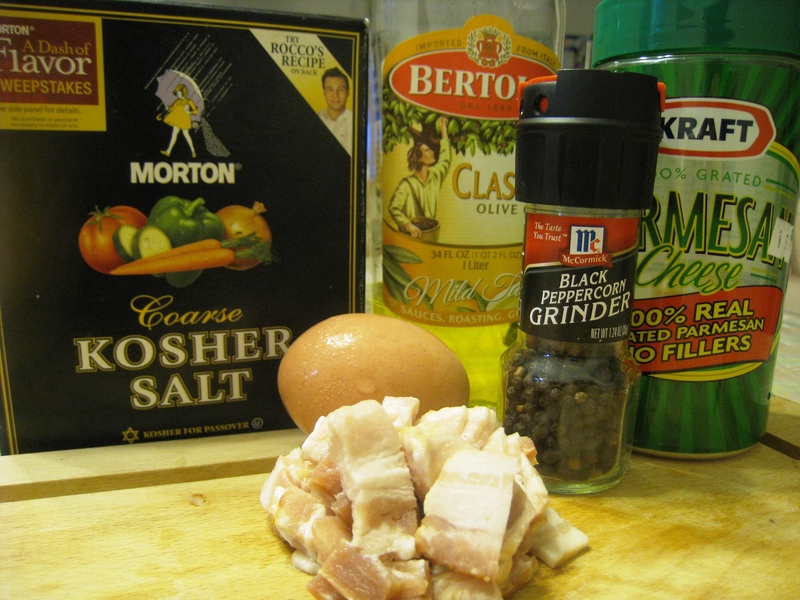 In my recipe I say “dice” the guanciale, pancetta or streaky bacon. But you can just simply slice it any which way you want. A serving portion for one needs about a quarter of a pound of dried pasta. That’s a quarter of a pack or box. To clarify, this again is a portion for one – make that, “one eNTeNG.” Two less hungry people can share this amount. 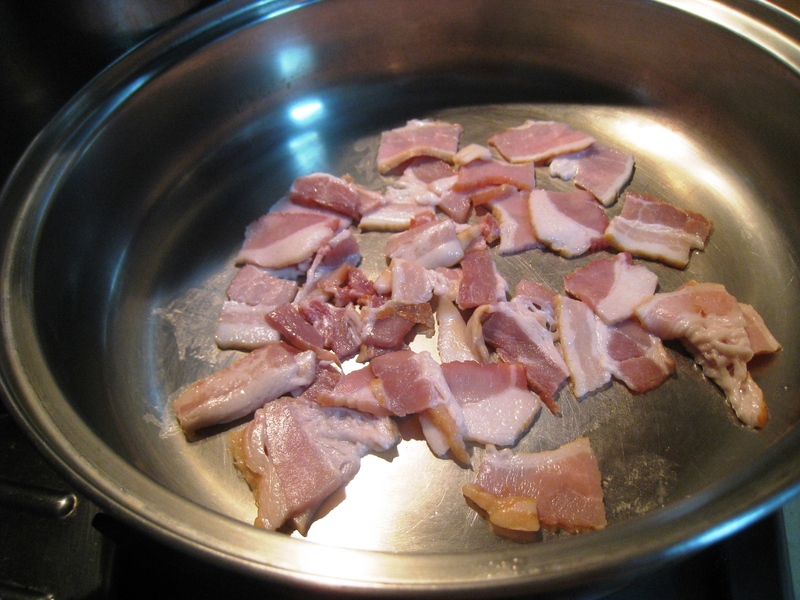 To a heavy bottom skillet on medium flame, add a kiss of Bertolli® Classico olive oil (“mild taste”) and three to five strips of SuperFresh® Danish streaky bacon that have been diced. While the fat renders out, crack one large whole egg into a bowl and beat it until frothy. In a separate bowl or on to a huge wooden cutting board, grate half a cup each of Pecorino Romano and Parmigiano–Reggiano cheese. Or, just cheat by using Kraft® 100% real grated parmesan cheese – nothing wrong with that. 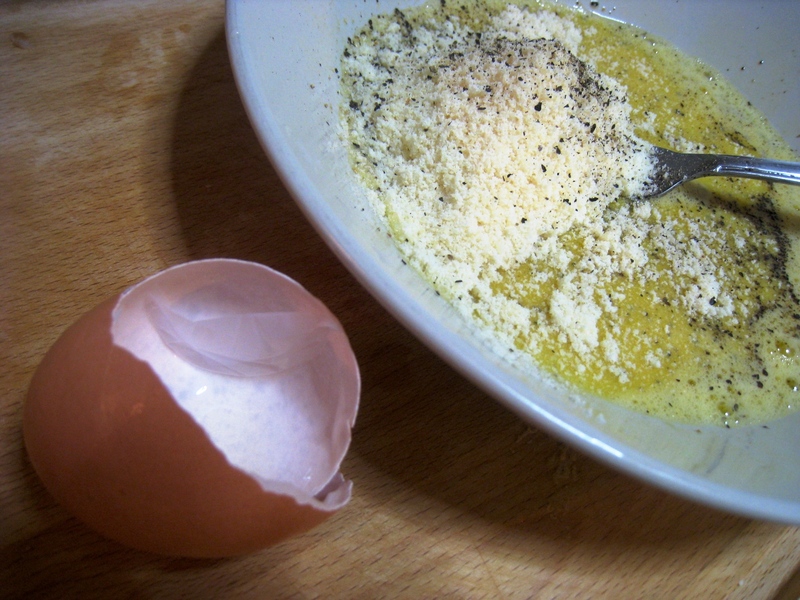 Add the cheese (or cheeses) to the beaten egg and freshly crack lots of McCormick® black pepper into the mixture. Stir to combine. 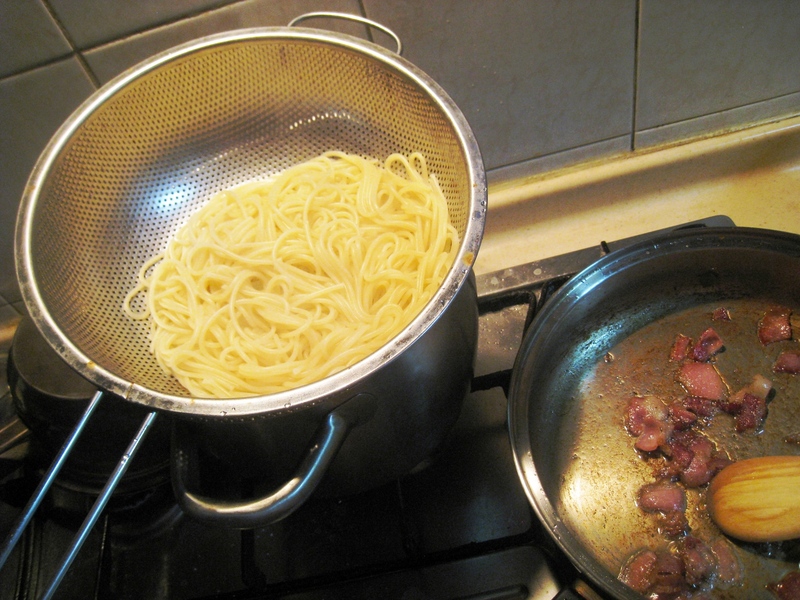 Drain the pasta when it is done, but set aside about a quarter of a cup of the pasta water. 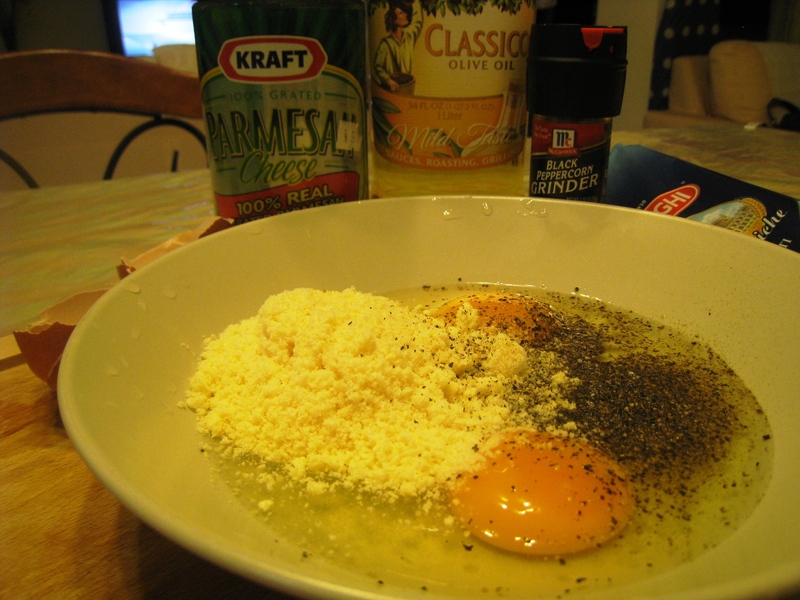 Add the pasta to the egg and cheese mixture and quickly toss it well. 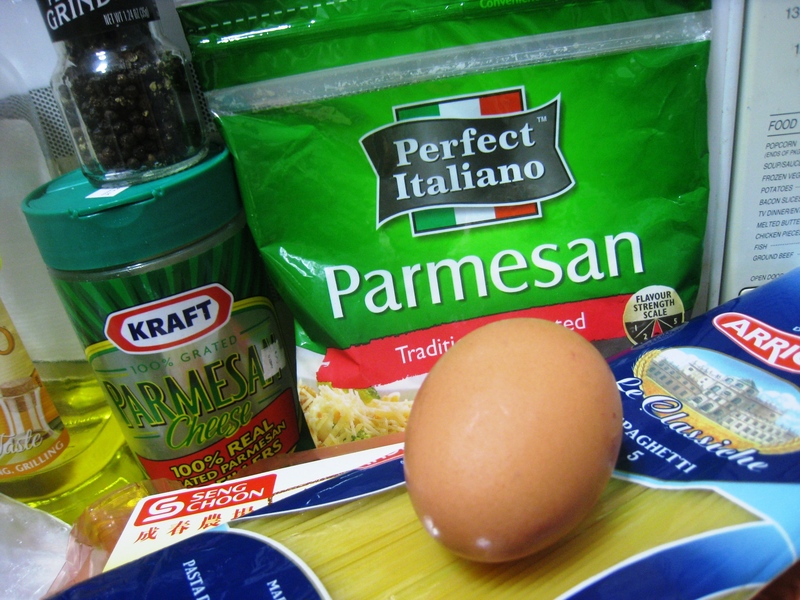 You’re essentially cooking the egg with the heat of the pasta. 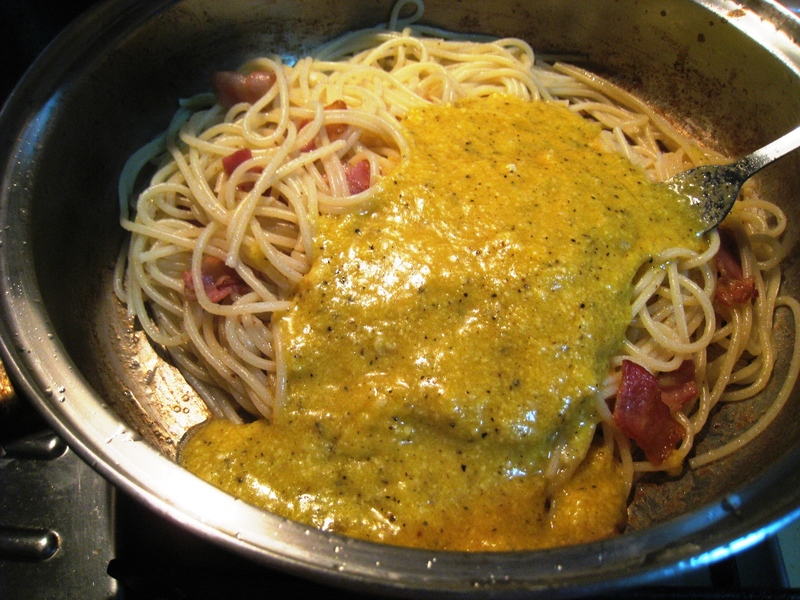 To further emulsify the sauce, add the pasta water gradually – you don’t need to add all of it in. Now, add the crisped streaky bacon, a splash of the rendered out fat (already mixed with that “kiss” of the olive oil), and toss all together. Taste for seasoning. As needed, you may add a little more cheese and black pepper. Enjoy! Didn’t I tell you that this can make you feel rewarded, spoiled, and incredibly indulgent? Heaven. I’m in heaven. The ease of making pasta lies in the fact that the sauce will almost always be ready by the time the pasta is done. That is, “al dente”. 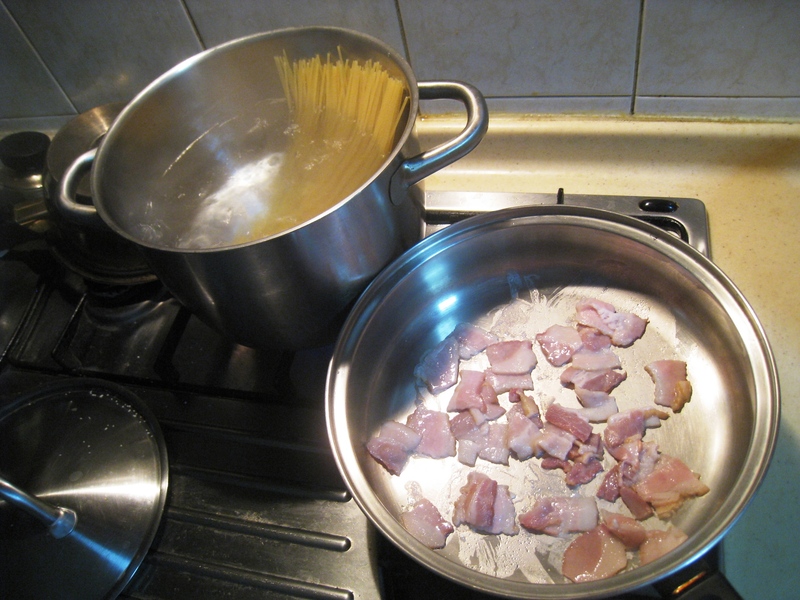 For my spaghetti alla carbonara, I start rendering the bacon (fat) after I have plunged the dried pasta in the boiling water. From this point, total cooking time should be 10 minutes almost exactly! Get ’em sizzling. To a heavy bottom skillet on medium flame, add a kiss of Bertolli® Classico olive oil (“mild taste”) and three to five strips of SuperFresh® Danish streaky bacon that have been diced. Get it crackin’! 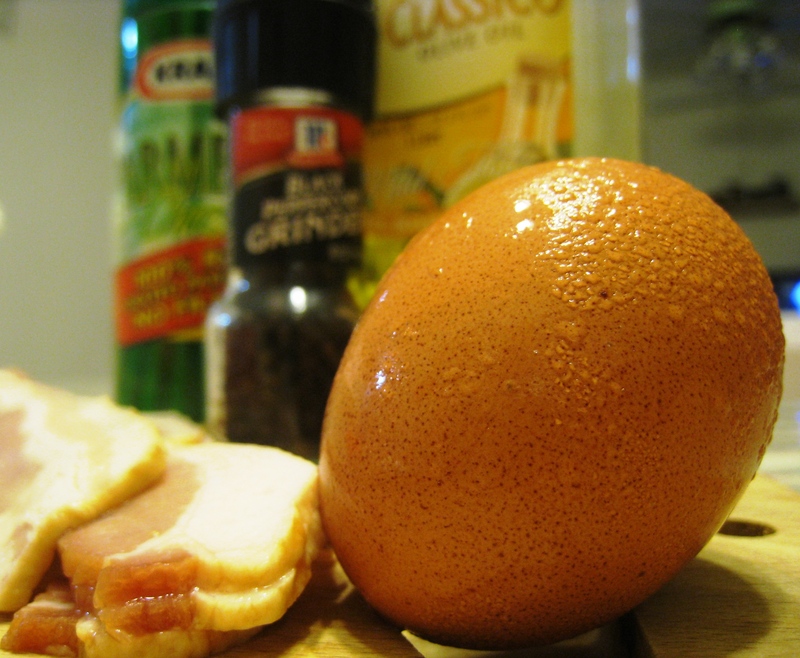 While the fat renders out from the streaky bacon, crack one large whole egg into a bowl and beat it until frothy. To this, you add the cheese or cheeses. No hard rule as to how much, besides “as much as you want of equal parts Pecorino Romano and Parmigiano–Reggiano.” My recipes will never hold you under s tyranny. See, sometimes I don’t even follow my own recipe. 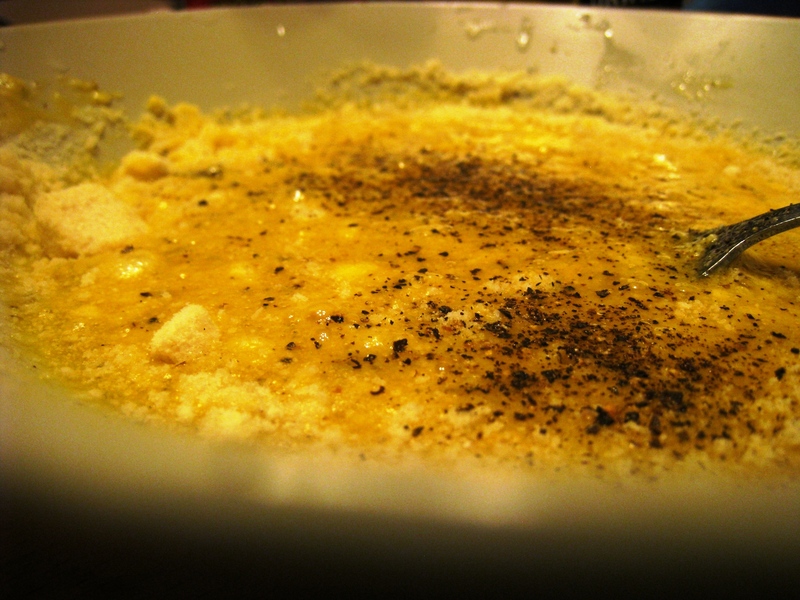 On nights when I would feel as over incredibly indulgent as lazy, I wouldn’t even mind beating the eggs until frothy before I dump the cheese and freshly cracked black pepper in. Clearly it works just fine. Just don’t start by whisking vigorously or you’ll end up with cheese all over your face. This is the golden sunshine of a sauce, waiting to be hit by the heat of the pasta. This is quite “savory” – the cheeses are nutty, the egg creamy, and the freshly cracked black pepper oozing with boskiness. Yum. Getting there. 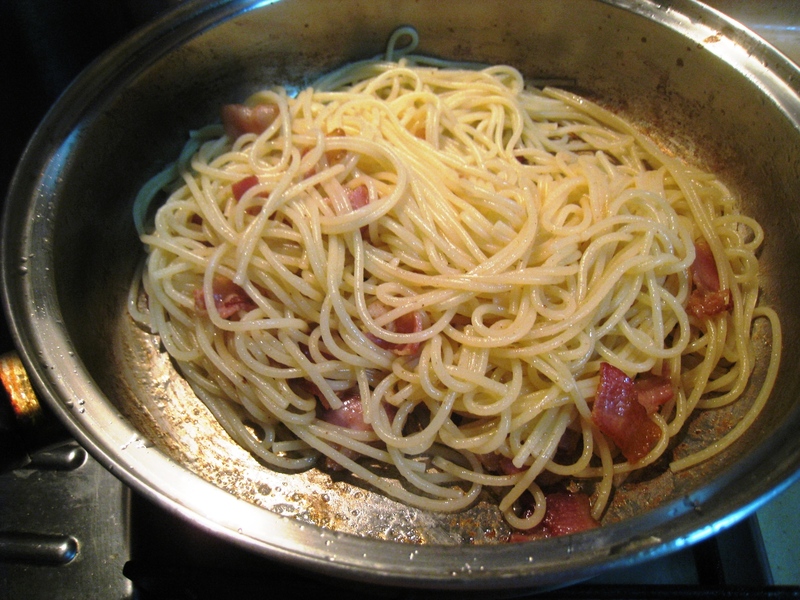 The pasta and the bacon are done. At this point, all you need to prepare for is to.. toss, toss, toss… and toss well! Make sure you did set aside a little of the pasta water! The starch that the dried pasta gave off to the water will help further emulsify the sauce. My mouth is watering just thinking about it! I do beg you to please try to follow my recipe. 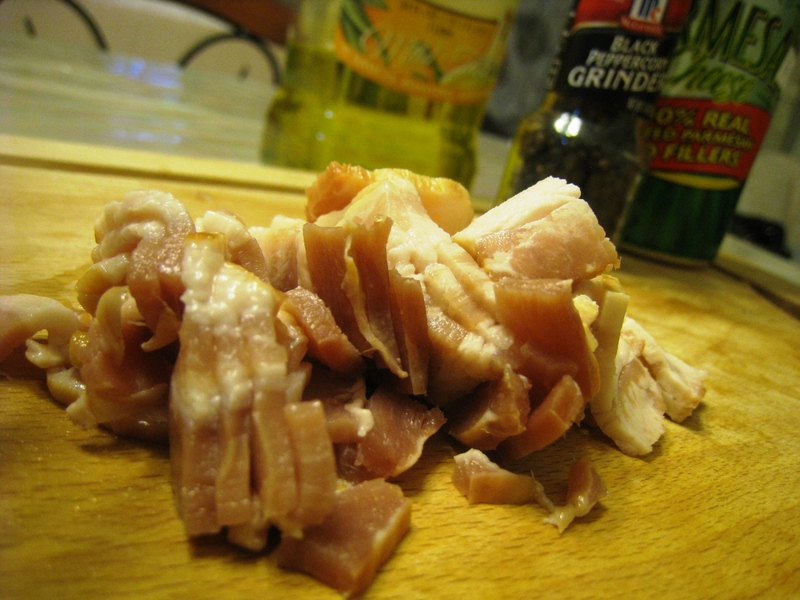 BUT, nothing is keeping you from tipping the pasta over to the pot where the bacon rendered its fat. Again, one of those lazy nights. Haha! 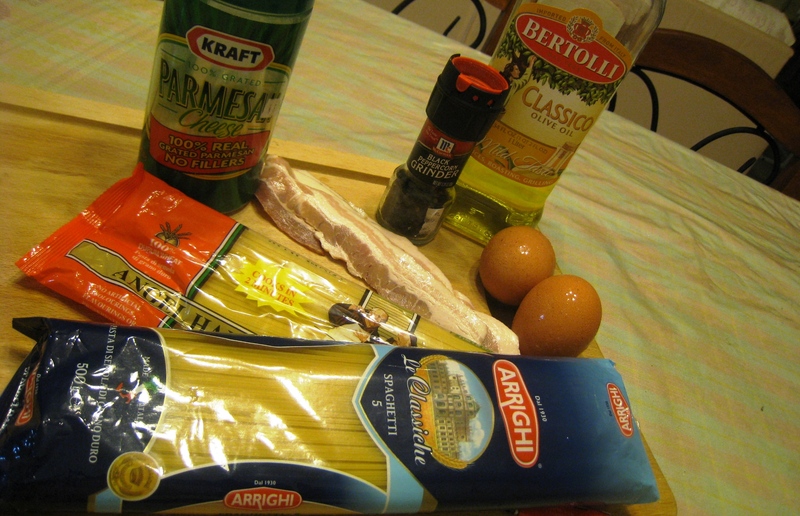 The only drawback of doing this is that the strands of spaghetti will be coated with the oil and fat, and to a certain extent, will make it a bit difficult for the (egg) sauce to cling to the pasta. But the result is delicious just the same. In keeping with the lazy mood I was in on the night I took this, I poured the sauce on to the already-mixed spaghetti and bacon. Then, I tossed like crazy. I tumbled the tossed pasta back into the bowl where I mixed the sauce. I have to say, this was such a delicious, scrumptious bowl I brought back to the bedroom with me. This was the last one I made. Just last night. Make that way past midnight! This bowl was the result of all the steps outlined in my recipe. I must’ve slurped my way through the spaghetti. Hahaha! It was so good. 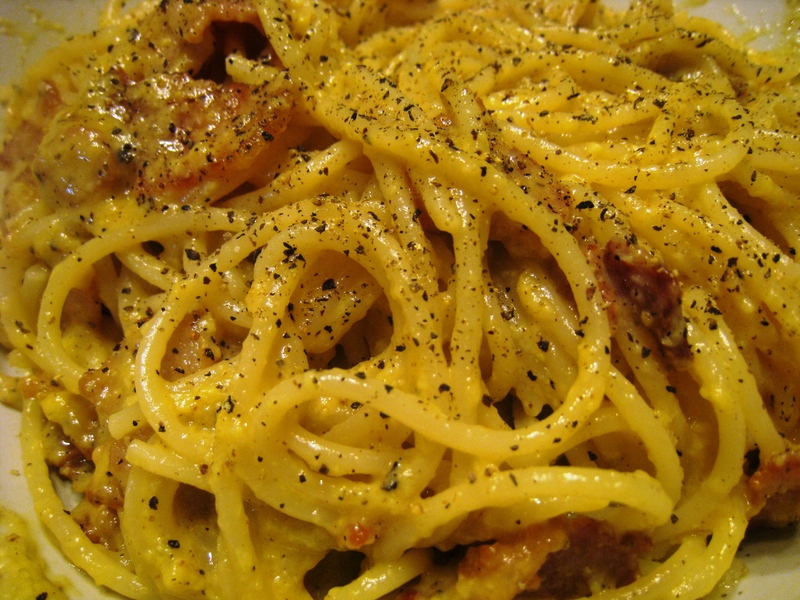 Spaghetti alla carbonara loosely translates to “coal miner’s spaghetti”. 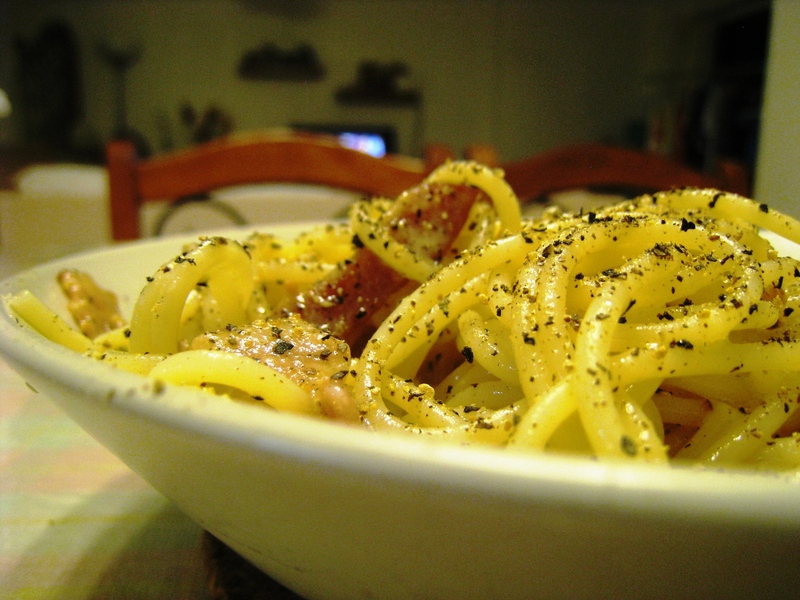 Like the other pasta I’m quite fond of, spaghetti alla carbonara has an interesting story. 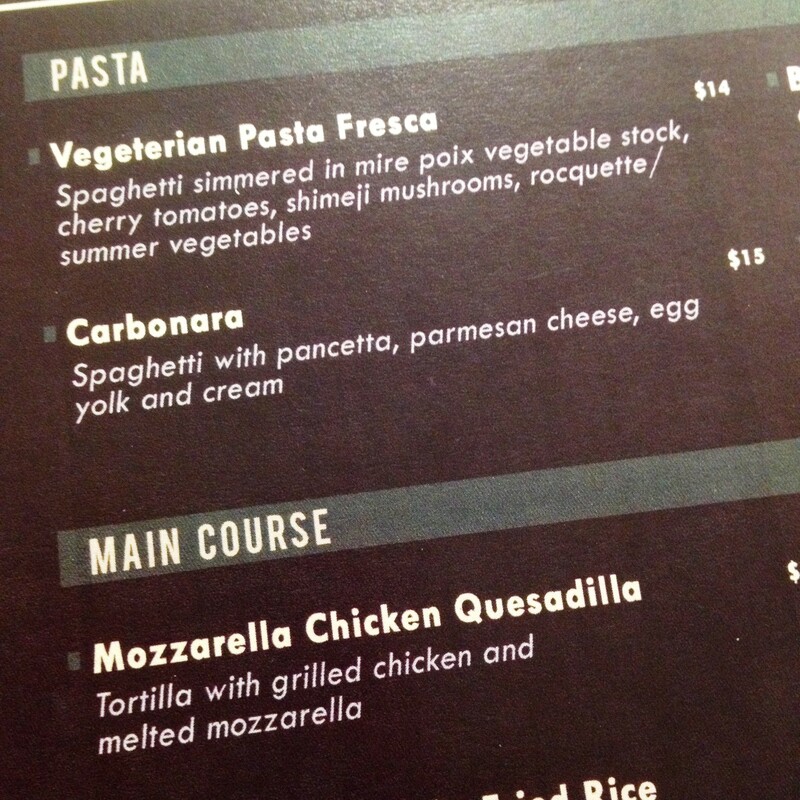 Legend has it, Italian men who work in the mines would whip this dish up quickly for lunch time. The generous sprinkling of black pepper reminds them of the coals. Hence the name. Hahaha!